We noticed that Sugi has an ability to concentrate without distraction. Sometimes he gets so focused on a scent that he doesn’t hear us calling him! We thought we would put this ability to practical use. A couple of years ago we did a tracking lesson with the owner of Canine Spirit (where Tom went to obedience school). She taught us how to track (follow a scent trail) and how to search (locate a scented item). Since then we have been training Sugi to find chanterelle mushrooms on our hikes! 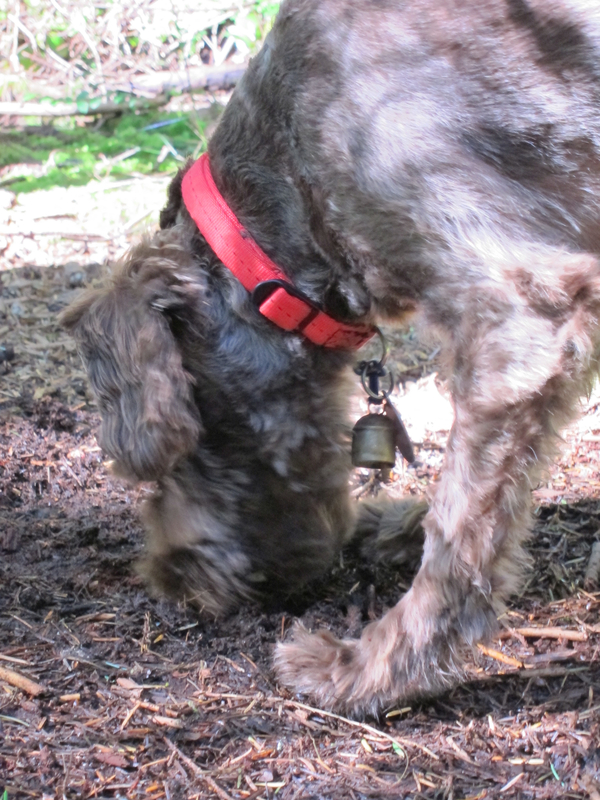 He is still learning how to do this…but he is also practicing his tracking ability every time we take him out on the trail. He seems to love finding a scent trail and then following it. Lesson from Sugi: When guiding a dog to overcome a fearful place or object, don’t use frustration, anger, force. Relax the leash! Allow the dog to come to the object or place through his choice using reward and praise. Story: One evening a few years ago, Greg took Tom and Sugi for a walk up to the grocery store on Commerical Drive. It was a regular thing we would do, blending a walk with the utility of grocery shopping. If Greg or I went on our own, we would leave the boys outside the shop while we picked up what we needed. Generally, they would wait outside patiently, sometimes shaking a bit with uncertainty. On this particular spring evening, it was abnormally windy. While Tom and Sugi were waiting outside the shop, the wind gave a sudden gust and knocked over the sandwich board next to them, startling Sugi. Panicked, he ran out into the middle of the road at full speed heading northbound down Commercial Drive, in the direction of home. Noticing that the dogs were no longer standing outside, Greg hurriedly left the store. People pointed in the direction of Sugi, and he noticed that passersby ran out to help Sugi and stop traffic so that he wouldn’t be hit. 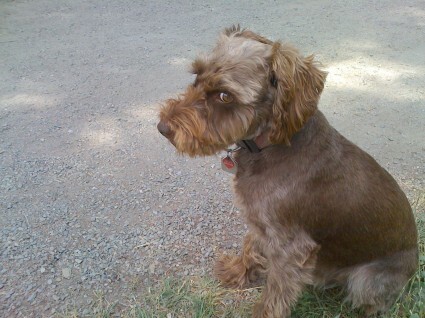 (I am very grateful to the people who assisted a small frightened dog!) Greg was able to catch Sugi who finally slowed down enough to pay attention to his calls. After that incident, Sugi refused to come within a block of Commercial. Somehow he knew all the streets surrounding Commercial we could not fool him by taking an alternate route. He would freeze and no amount of coaxing or leash pulling would help. Turns out that Sugi was also scared of things along the street: sign boards, metal grates in the sidewalk, mailboxes, newspaper boxes. The incident with the sandwich board seemed to have sensitized him to unknown objects. When he stopped before an object and refused to move, I would slow down, even stop and let the leash go completely slack. Sugi would then trot along past and resume his walk. He seemed to be saying “just give me a minute while I make sure it’s safe…OK”. We would give him loads of praise! Sugi is much more confident now. He’ll even walk over a metal grate in the sidewalk! He’s a persistent and courageous character at heart, desiring to move forward beyond fear.